As expected, Microsoft has launched a Web version of Xbox Music, allowing access to the service on computers that don't run Windows 8. 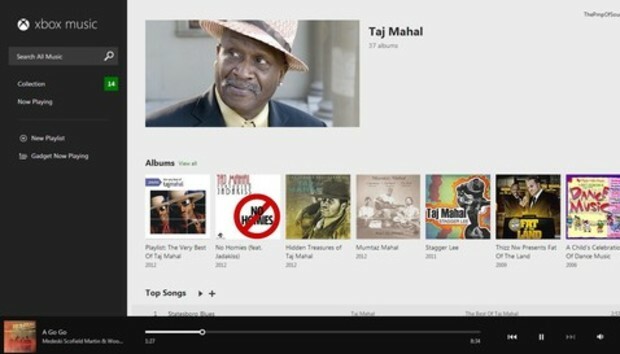 Before now, Xbox Music had only been available on devices running Windows 8, Windows Phone 8, or on the Xbox 360. Microsoft has promised apps for iOS and Android, but hasn't released them yet. This Web app, available at music.xbox.com, extends access to any desktop browser. Be warned, however, that the Xbox Music Web app is a bare-bones experience that doesn't compare to rival services from Spotify and Google. And unlike the Windows 8 app, which offers 10 hours of free listening per month, the Web version requires a $10-per-month subscription to Xbox Music Pass. Xbox Music lets you listen to your collection, create playlists, and search for new music on the Web--and that's it. The radio feature that creates artist-based "stations" has been omitted, and there are no avenues for discovering new music, aside from the "Related Artists" links that appear in musicians' bio pages. Compare this to Google Play Music All Access, whose Web app offers an "Explore" section with featured playlists, recommendations, new releases, and the ability to browse by genre. Or compare it to Spotify, with its endless feed of recommendations based on your preferences and other trends. Both of those services offer radio in their Web apps as well, and Spotify doesn't even require a paid subscription to access its huge library of streaming songs. If you already have an Xbox Music subscription, the Web app is better than nothing, because it'll at least let you access your songs and playlists from more places. But right now, that's all it is--a supplement to the existing apps for Windows 8, Windows Phone, and Xbox 360. If you're looking for a streaming music service that isn't so dependent on Microsoft's platforms, Xbox Music still doesn't make much sense.